Those of you who can't wait to get your hands on an iPad Pro now have a date to circle on your calendar. The new large format Apple slate will reportedly hit online and brick & mortar stores on November 11. It was previously rumored that the iPad Pro would be released during the first week of November, but 9to5Mac sources are saying that the hybrid laptop and tablet will be launched during the second week of the month. It will come with a previously-reported price tag of $799 (around £599, AU$1199) for the 32GB model. The tablet can be configured with up to 128GB and 4G LTE, but this specced-out model will cost $1079 (around £702, AU$1536). 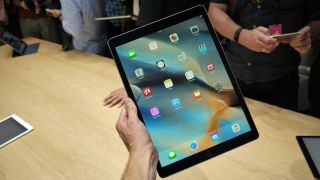 The iPad Pro features a 12.9-inch display with a 2,732 x 2,048 resolution capable of showing 5.6 million pixels. The slate comes with an A9X chip, Apple's third generation 64-bit processor, which is 1.5 times faster than the A8X. It features a battery that can run on a single charge for 10 hours, according to Apple. It weighs 1.57 pounds (712g) and it is available in gold, silver and space grey. Two optional accessories make the iPad Pro an excellent device for productivity: the Apple Pencil and the Smart Keyboard. The keyboard connects to the tablet via a Smart Connector that carries power and data via a magnetic connection. The Apple Pencil, which is Apple's version of a stylus, features Force Touch technology, enabling the tablet to pick up on pressure, angle, dimension and any other complex data entry positioning.